The college quarter has started, which means of course, sadly enough, a drop in knitting and spinning productivity. I am working on a little bit when I can, now and then, but mostly small projects. Well, all socks at the moment. I really, really like socks. You know. I'm working with some orange wool right now... and it is not a fun experience. The stuff I'm creating looks about the same or worse than my *first* spinning project! I got the wool for super-cheap off Etsy, so I know I should complain too much. It's mill ends, so that might have something to do with it, and it was squeezed quite a bit to get into the bag it was shipped in. I was aiming on getting something that I could make into a nice useful 2-ply worsted weight, but I gave up on that many a yard ago. Now I'm just spinning it however it wants to spin, thick and thin, and I'll make it into a scarf along with all of my other first practice handspuns. The wool is probably a blend of a bunch of different breeds, all dyed orange. 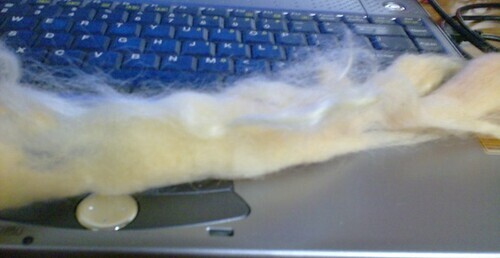 The dyeing is nice, a semisolid pale orangey yellow color. A small sample of the wool I pulled out had a staple length of about 3 1/2 inches or so. There is a tiny bit of something else mixed in with the homogenous wool, though. I encountered it a little way through the roving. It's not in the whole thing, just for a small part of it. It's soft, very nice and soft, and shiny too. It reminded me of doll hair - it looks and feels almost exactly like Barbie hair, sort of waxy. The staple length is also much longer - over 7 inches! Anyone know what this could be? I'm not really up on my fiber types yet. I'm assuming it's a sort of wool, rather than mohair or something, just because the roving was listed as "wool" when I bought it. But I guess it could be a little of something else mixed in, also. It was really nice. If I find out what it is, I want to get more of it. I'm working on... Let's see... three pairs of socks. With a fourth and fifth hibernating, and one to be cast on soon. Number one is my traveling sock, which I keep in my bag and knit on the bus and waiting for class. It's Regia Bamboo, and the pattern is loosely Thuja from Knitty. Number two is late Christmas socks for my friend Jacqueline. They're stockinette on the foot, with cables on the ribbing on the leg, in Knitpicks Essential. Number three is my first try at Magic Loop. The pattern is Anastasia, and the yarn is Panda Cotton. It's... interesting. One because of the Magic Loop, and two because of the damned splitty yarn. I haven't even gotten to the pattern part yet - I'm still on the toes. The one I hope to cast on soon is my Noro sock yarn. Oh, it's gorgeous. Not very soft, of course, being Noro and all, but loooovelllyyy. I got it at Knitters' Mercantile. I've also got a number of various WIPs tucked away in my Cupboard of Knitting, but those aren't worth mentioning. I haven't worked on any of them in weeks.